This is the story of an unexpected encounter between Mario and the irreverent Rabbids. The Mushroom Kingdom has been torn apart by a mysterious vortex, transporting the Rabbids into the once-peaceful area, splintering this beloved land. 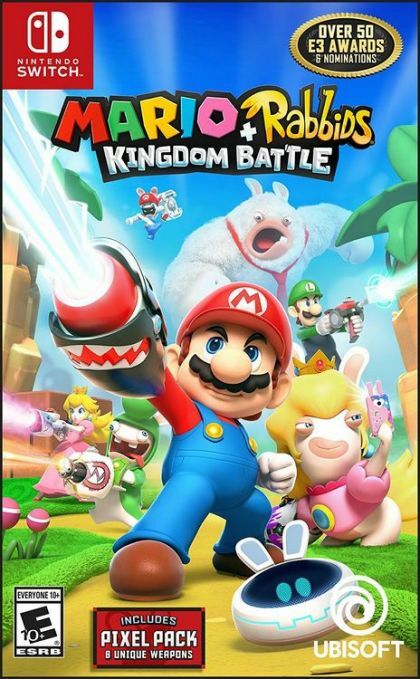 To bring order back to the Kingdom, Mario, Luigi, Princess Peach, and Yoshi team up with Rabbids heroes in a journey through four different worlds. Join these eight heroes to explore a new world twisted by the mischievous Rabbids, filled with secrets and nods to classic Mario games! Outwit unpredictable enemies in dynamic turn-based combat and co-op challenges, and solve puzzles along the way. Discover a feel-good and modern combat adventure designed exclusively for the Nintendo Switch™ system, playable anywhere, anytime, with anyone. Embark with your team of heroes on an epic quest to free your friends and put the Mushroom Kingdom back in order! Explore four iconic worlds filled with chests and secrets, solve puzzles, and defeat unpredictable enemies on the battlefield. Mario and his friends will use never-before-seen weapons to engage in combat with their foes. With an arsenal of more than 250 weapons with unique statistics and specificities, players will choose how best to equip each of their eight heroes. Play additional co-op challenges with a friend in local multiplayer, featuring three levels of difficulty. Share a pair of Joy-Con™ controllers or use your Nintendo Switch™ Pro Controllers. Discover the Mushroom Kingdom like you never have before — twisted by the mischievous Rabbids! Experience a feel-good adventure filled with humor, epic music, vibrant animation, and colorful visuals, powered by the Snowdrop™ engine. A game as appealing in handheld mode as on your TV screen. Play everywhere, and even on the go, thanks to short game sessions. Unlock new in-game features with your amiibo™ figures.